Pune, the cultural capital of Maharashtra, is a beautiful mix of the old-world charm and the trendy young vibe. From being the powerhouse of the Maratha Empire to the residence of many Indian freedom fighters, this diverse cultural history has seeped into the fare served in Pune. If you’re craving some authentic Pune fare to dig into, look no further than these dishes from iconic Pune outlets. These 5 dishes in Pune will be the best history lesson you’ve ever had! 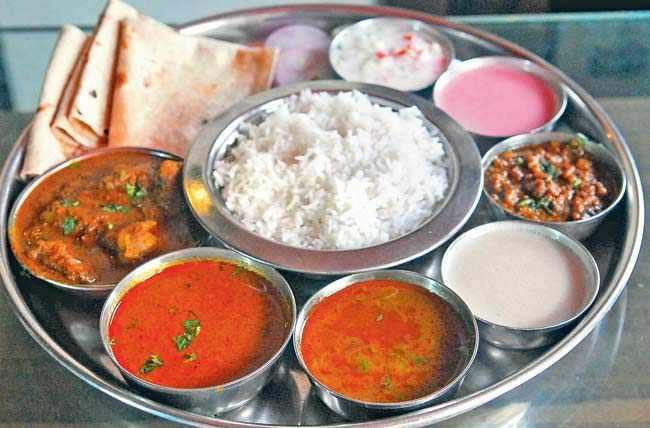 This thali offered by Maratha Samrat is the best meal to taste the lip-smacking Maharashtrian cuisine. With biryani, two types of chicken fry and chapati, you also get the classic Thambda (red) rassa and ‘Pandhra (white) rassa, a type of spicy, soupy curry from Kolhapur. Although the history behind the name is unclear, Mastani is the crystal-clear answer to any summer day. A rich, creamy milkshake topped with fruits and whipped cream, Mango Mastani was invented in Pune almost half a century ago and is still served with an additional 33 flavours! Misal, the word for ‘mixture’ in Marathi, is a lesser-known sibling of Maharashtra’s popular street food, vada pav. It’s a nutritious midday snack served with pav (bun) that comes in a variety of flavors ranging from mild to spicy. Masti Misal churns out this classic street food combined with dahi butti and buttermilk. Appreciate a century’s worth of history from the British era to present post-Independence India with a simple Bun Maska (bun with a helping of butter) and Iraani Chai from Cafe Goodluck. Even with an Iranian origin, this restaurant has been around for so long that it’s now a part of Pune’s food culture. Kothimbir Vadi (or coriander fritters) is a classic Marathi tea-time snack. There’s also another type of fritter called Alu Vadi, made from Colocasia leaves. J1, known for its traditional Maharashtrian fare, serves these heavenly bites at their best. How many of these monumental dishes have you ticked off your food list? Fire up the Swiggy app and order in now to get a head-start! Previous articleHunting For Vegetarian Food In Mumbai? 7 Places You Could Consider!